Pastors say the economy continues to have a negative impact on their churches despite stabilized giving, according to a survey by LifeWay Research. 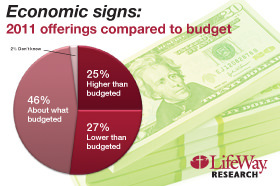 Although the offerings in most American churches have met or exceeded budget requirements in 2011, the economy is still having a negative impact on local congregations. The National Bureau of Economic Research (NBER) declared in September that the recession that began in December 2007 ended in June 2009.